One of our clients was an Amazon seller seeking help to analyze and write a Plan of action. She was an elderly woman selling garden seeds and had no employees working with her. She was suspended due to late shipments because of a software she was using that was malfunctioning. Shopify, which helped process her orders, messed up her account and she was suspended in response to it malfunctioning. This isn’t the first time a client has contacted us about a Shopify issue causing an Amazon seller to be suspended. Dana Rodriguez, one of our college-educated paralegals, worked with our entire team for this case. After speaking with the client directly, guiding her on how and what to write while drafting a Plan of Action, the client was reinstated on her very first Plan of Action sent to Amazon. Amazon sellers get the benefit of our entire team. We owe a lot of our success to our paralegals that help save accounts and jobs. Dana is just one of our many diligent paralegals that work one-on-one with clients to get them reinstated as quickly and efficiently as possible. 1.) 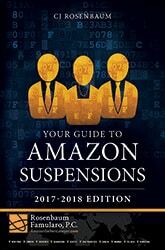 Educate Amazon sellers about how to avoid suspensions. 2.) Teach suspended Amazon sellers how to get their accounts / ASINs quickly reinstated. Inauthentic Items, Review Manipulation, Intellectual Property Complaints & more!